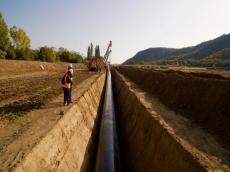 The micro-tunnel waterproofed pit is now complete as part of construction of the Trans Adriatic Pipeline (TAP) in Italy’s Puglia, Gabriele Lanza, TAP project manager for Italy. “Work continues in the micro-tunnel area. The secant piles, which form the lateral walls of the pit, have been installed and the bottom plug of the pit using a special jet grouting technique is also now finished,” he said in a video published on TAP AG consortium’s website. Lanza noted that next steps include the completion of concrete works inside the pit. “This includes pushing out the wall with a Tunnel Boring Machine and putting in place what is needed to build the final grade of the pit floor,” he added.